Adult Gollie—mom is a Collie, dad a Golden Retriever. The Gollie is not a purebred dog. 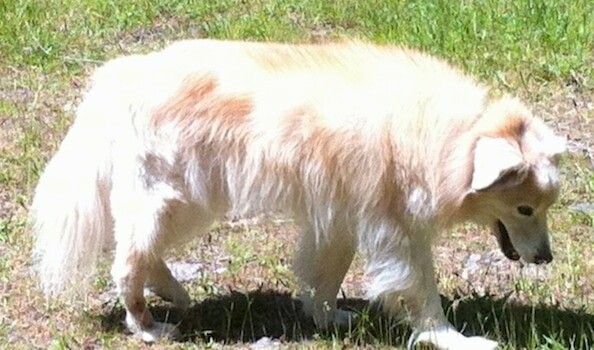 It is a cross between the Collie and the Golden Retriever. The best way to determine the temperament of a mixed breed is to look up all breeds in the cross and know you can get any combination of any of the characteristics found in either breed. Not all of these designer hybrid dogs being bred are 50% purebred to 50% purebred. It is very common for breeders to breed multi-generation crosses. 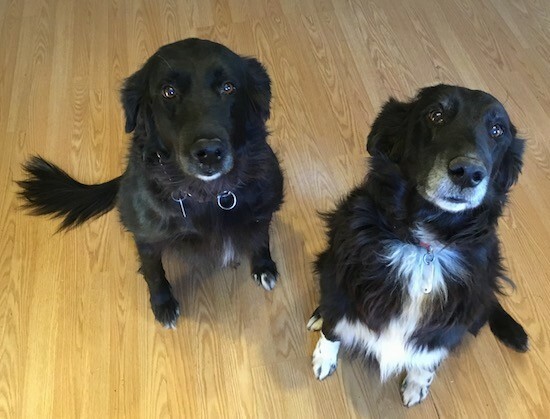 Deridere and Cecilia the Gollies (Golden Retriever/ Collie mixes) at 11 years old—"Deirdre is from the very first official Gollie litter in 2006. Cecilia is from the 4th and final litter in 2007. They are half sisters. Both were gathered by AKC Rough Coated Collie “Gabe”. Deirdre’s mother was Grace and Cecilia’s was Penny who were both AKC Golden Retrievers. PS - There is a recessive black color gene in both breeds that makes them all come out dark." "This is Lady, the dog we got in the early ’90s. She lived to be about 16 years old. Her mother was a red Golden Retriever, and her father was a tricolor Collie. She was born long before hybrid dogs became popular, and we got her for free. I took this picture of her about a year before she died." 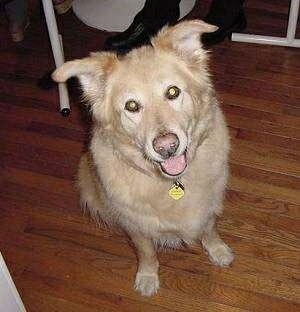 "She was an excellent dog, easygoing but full of energy. Even when she was very old, she still had enough zip to outrun me. She had such an even temperament, and liked everyone—even the vet, who oddly was one of her favorite people." "She was so interesting to watch because you could see she felt the pull of both breeds. There were times when the horses got out and we had to round them up that she would get the most puzzled look on her face, as though she knew there was something here that she ought to do, but couldn't quite put her paw on it. But she was also an excellent retriever. She had an instinctively "soft mouth," and there were a few times in her life when she would bring me a dead bird she had found, and ceremonially lay it at my feet as though her entire life had been spent as a gundog." "She was intelligent and an excellent companion. I've always said that if I ever hear of a litter of Retriever x Collie puppies, I'll drop everything to go have a look at them, just on the chance of finding another dog like her. I still catch myself, 2 years after her death, looking out the kitchen window at her favorite resting spot, just to see if she's there." 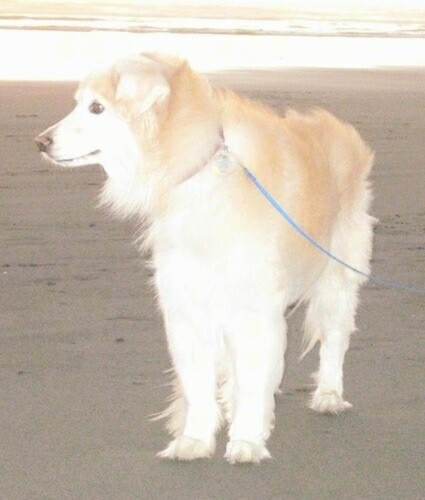 Seth the Gollie (Golden Retriever/ Collie mix) at 15 years old—"Seth was a Golden Retriever/Collie mix rescue puppy. He lived to be over 16 years old. Besides a couple of malignant tumors that were caught early (when he was 10-12 years old), he didn't have any major health issues until he tore his cranial cruciate ligament just before his 16th birthday." "Unlike many of the Gollies shown on the DogBreedInfo site, in Sasha the coloring and looks of the Golden Retriever dominates. Her "Collie" shows mostly in the ears and the ruff of fur around her neck." 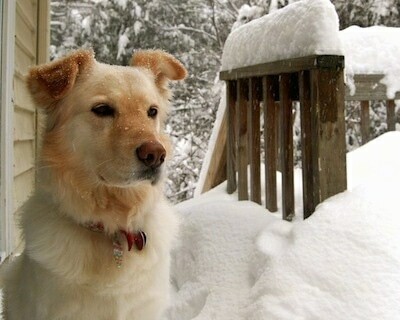 "Here's a shot of our dog, Sasha, a Golden retriever / Collie (Gollie) mix at 4 years old. 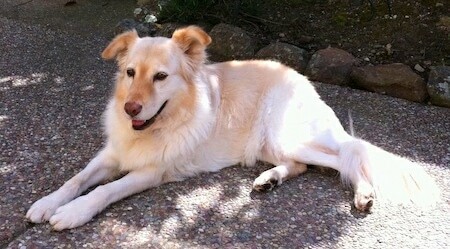 Sasha is the most mild-mannered dog we've owned. She's smart, quiet, loyal, patient and friendly to all, including other dogs (actually her "best friend" is one of our cats; they're always together). Sasha will bark at the doorbell, but welcomes anyone we let in. While we don't walk her off-leash, she'll frequently attend us in the yard without bolting off. She has the ruff-like "mane," pointed muzzle and perky ears of a Collie, and the coloring and eagerness to please of a retriever." Sandy the Gollie—"This dog is probably one of the cutest, sweetest dogs on the planet! 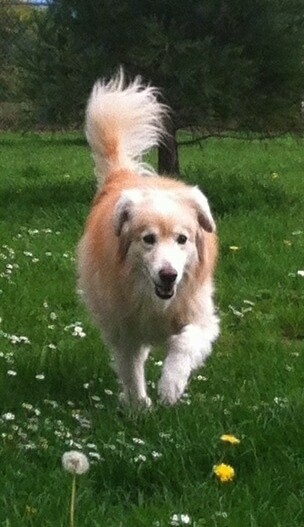 She is a Collie / Golden Retriever cross (Gollie). They got her from the Toronto Humane Society when she was a puppy. Unfortunately she had been abused, but they took her in and raised her to be the sweet dog that she is!! " "Deirdre (the big one) at 8 months old and an 8-week-old Gollie puppy from the next litter with the same set of parents—these dogs have wonderful temperaments, but they were being extra good when this photograph was taken."